May 7, 2017: The James Webb Space Telescope is pushed into the clean room of Building 32. Building 32 houses Chamber A, the thermal vacuum chamber where the telescope will have its final thermal vacuum testing. NASA's James Webb Space Telescope has arrived at NASA’s Johnson Space Center in Houston, Texas, where it will undergo its last cryogenic test before it is launched into space in 2018. The telescope was loaded onto a trailer truck from NASA’s Goddard Space Flight Center in Greenbelt, Maryland, and moved slowly down a highway by the Webb team to U.S. Air Force’s Joint Base Andrews in Maryland. At Andrews, the telescope was then loaded onto a C-5 aircraft and flown to Ellington Field in Houston, Texas. When the C-5 landed at Ellington, the telescope was carefully unloaded and delivered to NASA Johnson. In the coming weeks, the telescope will be prepared for a final cryogenic test that will run approximately 100 days. 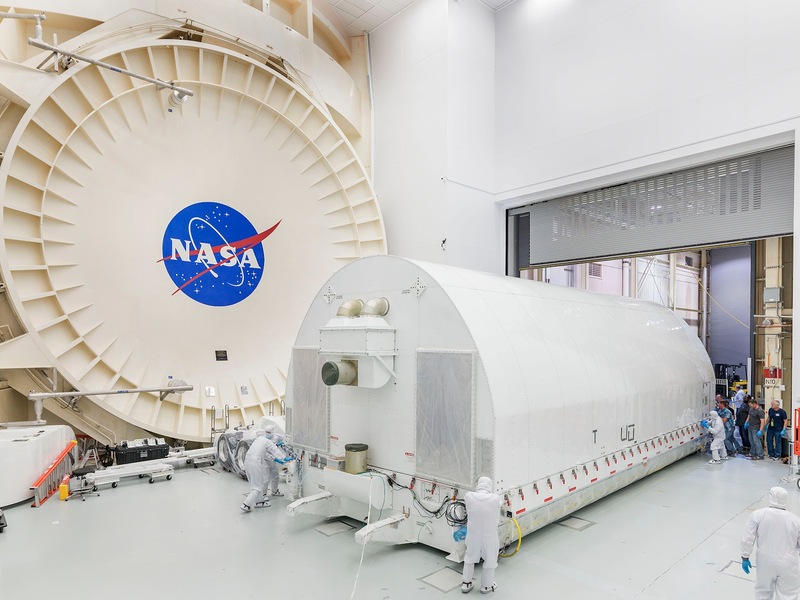 Then, it will continue its journey to Northrop Grumman Aerospace Systems in Redondo Beach, California, for final integration and testing with the remainder of the Webb Observatory—the sunshield and spacecraft bus—prior to launch. To ensure the telescope's optics will operate at its frigid destination 1 million miles out in space, it must complete several cryogenic tests. The last cryogenic test will occur in Johnson's Chamber A, the same vacuum chamber where the Apollo spacecraft were tested. This critical end-to-end optical test will test the telescope at its extremely cold operating temperatures—at 40 Kelvin—the temperature that it will operate in space. The James Webb Space Telescope is the world’s most advanced space observatory. This engineering marvel is designed to unravel some of the greatest mysteries of the universe, from discovering the first stars and galaxies that formed after the big bang to studying the atmospheres of planets around other stars. It is a joint project of NASA, the European Space Agency (ESA) and the Canadian Space Agency (CSA).